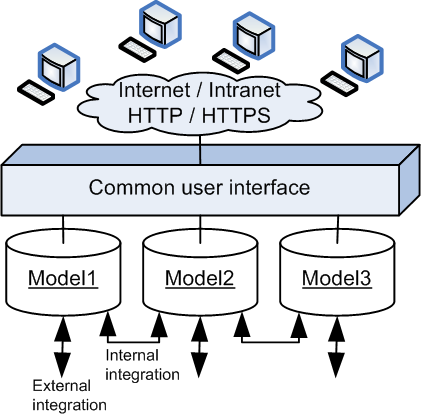 FrePPLe supports working with multiple models in the same web application. What-if models to support scenario analysis. A planner can do all kinds of what-if analysis in a copy of the production model. Separate models for separate product lines or different factories. When the interaction between product divisions or plants is relatively low, it might be useful to create seperate models for the planners to work in. This allows their business processes, planner workflows and data to be more loosely coupled. 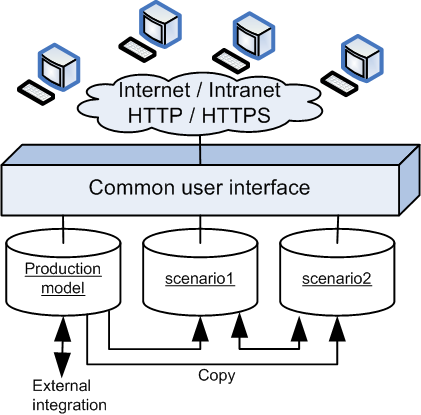 The following steps are required to configure a multi-model setup. The database administrator needs to create a PostgreSQL database for each model. The connection details of each schema need to be added as a seperate section for the DATABASES parameter in the file settings.py. The number of schemas in the web application is unlimited. Extra schema’s have NO impact on the performance of the user interface. Only the disk space used by the database will increase. One of the schemas MUST be called ‘default’. All information on user logins, user preferences and browser sessions are stored in this default schema. Use short and unambiguous names for the additional schemas. Since the names will be used as a prefix in the URLs they should be short and can’t contain any special characters. The databases can be located on different database servers or database instances, but this is not required. This could be useful for instance to avoid that users running large tasks on what-if scenarios impact the performance of the regular production model. If not done yet, the default schema is initialized with the following command. It creates all tables, indices and other database objects. The copy process might take a while for bigger datasets. If it takes too long, you should consider running the copy as an automated batch job during quiet hours. After a change in the djangosettings.py file, the web server needs to be restarted. Access rights are controlled for each scenario separately. After running the command frepple_copy only 1) the user executing the command and 2) superusers in the source scenario are marked active in the new scenario. Other users can be granted access by marking them active in the new scenario, and by assigning them appropriate privileges in it.